Upfront I have to inform you that this article does not contain any deep thoughts, goals, or hidden layers. It is just an article written by someone who has recently moved from Poland to the UK and in his getting-to-know-the-UK period observed some practical differences that he wants to share with you. This article is not about right or wrong. Nor is it aimed at ridiculing any of the countries. It is purely some observations, which might become handy if you yourself travel to the UK. So this article is not about that we are driving on the right side of the road. Here they don’t ride on the wrong side of the road, but just on the left side of the road. 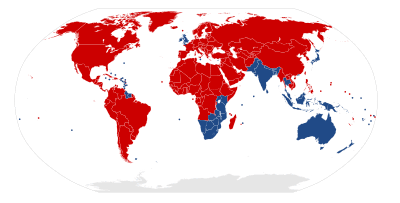 With countries as India, Pakistan, Sri Lanka, and Malasia also on driving on the left, it will not surprise you that about 35% of our world drives on the left. One can even say that we are different, because the UK’s General Highways Act of 1773 was created earlier than Napoleon introduced his law on the mainland to drive on the right side of the road. This article, however, is about that it is being made difficult here in the UK to calculate how much petrol your car uses. When you buy petrol you will see that a transformation towards the decimal system has set in: petrol is bought per liter. However, or at least in my car, the average fuel consumption is shown in miles per gallon. And while driving trying to figure out that if I do 35 miles to the gallon actually is 8.1 miles per liter, which costs me then around 8.70GBP, is just as dangerous as not using a hands-free kit. Also it is completely irrelevant to know how much 70 miles per hour is in kilometers. Current traffic congestion won’t get you to that imaginary speed anyway. It is far more interesting to know that on the motorway you are allowed the same maximum speed as on a dual carriage way. So why would one make that distinction anyway? And actually when you realize that the UK’s system of yards, feet, and inches is historically quite logic, especially when there weren’t yet centralized measure units, then the adaptation becomes quite easily. An inch originally was called a thumb. A foot is the size of an average man’s foot. And therefore a foot is (nowadays) 12 thumbs (inches). And a yard is the distance between King Henry 1’s nose to the thumb of his stretched out arm. So so far nothing shocking. All is logical and can easily be learnt or at least gotten used to. Of course, we also know that the electric plugs are different than ours and that when you move over you will end up with a house which is a mixture between European plugs, converters, and UK plugs. Tip: take a couple of multi-socket extension cables with you. These only need 1 converter and can connect multiple European plugs. Tip 2: When you decide to buy a UK multi-socket extension cable check the length of the cable. Standard the length of the cable is about 30 cm. Life gets more confusing when it comes to beds. Here bed sizes are measured in: Single, Queen, King, and Super King. And a King size bed is 65 inches by 80 inches, or 165cm by 203cm. Our European King size beds are, however, 63 inches by 79 inches, or 160cm by 200cm. So if you need to buy a bed in the UK forget about taken your bedlinen from home with you. It just does not fit. The same with pillows. Pillows in the UK are standard 50cm x 75cm. In Europe standard is 65cm x 100cm. So UK pillow cases don’t fit on your pillow if you took it with you. And European pillow cases look on an English pillow like clothes on a person who just lost 35kg, or 5.5 stone. One possible difficulty for the Polish is that the greeting “How are you?” is not supposed to be answered with anything else than a “Fine, thanks. And you?” to which you won’t get a reply. Or with a simple return “How are you?” Don’t fall into the Polish automatism to start explaining to a total stranger about how the haemorrhoids are really playing up after you ate this delicious curry last evening. Other things to get used to again when moving from Poland is that shops not standard are open till 9PM. And on Sundays most of them are closed. As well as that when you are not feeling well you just go to a general doctor who will decide for you whether you need someone else to look after you or not. It is not as in Poland that you first diagnose yourself and then go directly to a specialist. The doctor here is also not going to tell you how long you are going to be sick so that you can take off from work. When you feel better you go to work, which makes for me coming from The Netherlands still more sense. In the houses you will find the washing machine most likely in the kitchen. So be prepared for a mixture of chicken soup with freshly washed clothes. Also in most of the houses we looked at before renting, we noticed that most houses have one toilet. And it is located upstairs. One can say that this is handy for during the night. But did no one realise that it means that when you expect guests you also have to clean upstairs now? If you live here you have to invest in a tumble dryer. It is a must. You must be very lucky if you can hang your washes outside to dry. Chances are bigger that they get wetter from spontaneous outbursts of rain. Inside drying is also almost impossible. The climate is just too humid for this and drying really takes longer than in Poland. A difference that I personally quite like is regarding schooling. The system here does not force upon my children to carry a heavy rucksack of 5 kg and also they have far less homework in primary school than in Poland. This gives the children far more possibilities to rest after school and is, I believe, more beneficial to the children. Also I like the fact that my son has to dress up every day in his school uniform. Except for no more complaining in the morning whether he likes his Iron Man sweater more than the Ben 10 polo I prepared, it is more about equality between children. From my childhood I remember that there was a big distinction between the kids who wore Lacoste polos and the kids who didn’t. And that created unnecessary tension. It also has a downside though. I have been informed that this uniformity in clothes until children go to University has led to why English children quite young already are having tattoos. This being a way for them to differentiate themselves from others or more so create similarities. That part is quite understandable, but worrying. So there you have it. Just some simple observations without any judgement included. I have decided to live here and I am quite happy with that choice. It is a beautiful country and the people are really friendly. I just wanted to share with you my observations. Maybe they are handy for you one time when you go to England as a visitor or resident. I hope you enjoyed it and if you have any more differences, please, write them in the comments.